Noah, who God found to be righteous in an evil generation, takes his family, livestock and other animals into a huge ark he had obediently constructed. 7:1-3 The Lord then said to Noah, “Go into the ark, you and your whole family, because I have found you righteous in this generation. Take with you seven pairs of every kind of clean animal, a male and its mate, and one pair of every kind of unclean animal, a male and its mate, and also seven pairs of every kind of bird, male and female, to keep their various kinds alive throughout the earth. “Clean animal” – There was awareness of the correct animals for sacrifices long before the law concerning clean and unclean animals was given, Leviticus 11, Deuteronomy 14. “Seven days” – seven is sometimes used for a closing period, so there is a degree of urgency expressed here. “Forty days” – The number 40 is used in Scripture for receiving the law, Deut. 9:11 and the temptation of Jesus, Matt. 4:2. The wilderness wandering and King David’s reign over Israel are both stated as 40 years. This is a significant event and a significant time period. 11-12 In the six hundredth year of Noah’s life, on the seventeenth day of the second month – on that day all the springs of the great deep burst forth, and the floodgates of the heavens were opened. And rain fell on the earth forty days and forty nights. “Springs of the great deep… floodgates of the heavens” – evokes the creation and a reversing of the appearance of the land. The precise giving of the date is not symbolic, but evidence of an important fact well remembered by oral tradition. 13-16 On that very day Noah and his sons, Shem, Ham and Japheth, together with his wife and the wives of his three sons, entered the ark. They had with them every wild animal according to its kind, all livestock according to their kinds, every creature that moves along the ground according to its kind and every bird according to its kind, everything with wings. Pairs of all creatures that have the breath of life in them came to Noah and entered the ark. The animals going in were male and female of every living thing, as God had commanded Noah. Then the Lord shut him in. Noah and his family were monogamous, and numbered eight in all, 1 Peter 3:20. “As God had commanded Noah” – also v.5. At this early point of salvation history, righteousness is equated with obedience, and leads to salvation. Just when they could have been wiped out by judgment, God shows a fatherly touch by shutting them in. 17-18 For forty days the flood kept coming on the earth, and as the waters increased they lifted the ark high above the earth. 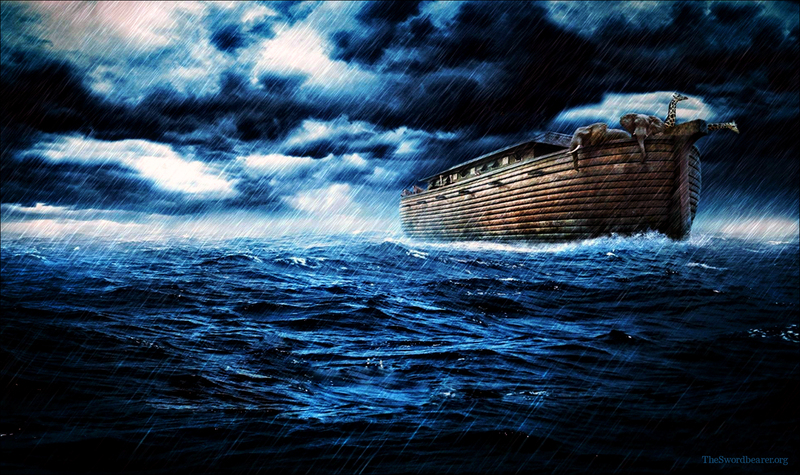 The waters rose and increased greatly on the earth, and the ark floated on the surface of the water. 8:6-12 After forty days Noah opened a window he had made in the ark and sent out a raven, and it kept flying back and forth until the water had dried up from the earth. Then he sent out a dove to see if the water had receded from the surface of the ground. But the dove could find nowhere to perch because there was water over all the surface of the earth; so it returned to Noah in the ark. He reached out his hand and took the dove and brought it back to himself in the ark. He waited seven more days and again sent out the dove from the ark. When the dove returned to him in the evening, there in its beak was a freshly plucked olive leaf! Then Noah knew that the water had receded from the earth. He waited seven more days and sent the dove out again, but this time it did not return to him. 13-14 By the first day of the first month of Noah’s six hundred and first year, the water had dried up from the earth. Noah then removed the covering from the ark and saw that the surface of the ground was dry. By the twenty-seventh day of the second month, the earth was completely dry. Noah looked for signs of dry land from 40 days onwards. And looked, and waited. Land appeared and the dove did not return a year and 10 days after the rain started; read together Genesis 7:6, 11 and 8:13-14. Noah waited for God’s command before leaving the ark. There are parallels here with the Creation story in Genesis 1, a picture of returning to “in the beginning”, but this time on the basis of covenant between God and man which is described at length, Gen. 8:20-9:17. This covenant is a unilateral promise, established by God without any particular participation, not just to Noah and his descendants, but to “every living creature”. This is the forerunner to later covenants, which by contrast are mutual and relational. 12-13 And God said, “This is the sign of the covenant I am making between me and you and every living creature with you, a covenant for all generations to come: I have set my rainbow in the clouds, and it will be the sign of the covenant between me and the earth. The geological data confirms a flood of the proportions described, over a large but limited area centred on Mesopotamia. However the account should be read and understood in its own terms – a judgment in which the entire living scene is destroyed. This informs the N.T. teaching of an impending greater judgment of the universe itself, 2 Peter 3:5-7. This is a remarkable account of one stubbornly righteous man, Noah, who obeyed God and not the cultural pressures of his generation, and it speaks down the millennia. God wants us for Himself, and wants us to to be right with Him in our attitudes and intentions. Every conflict recorded in the Bible and in church history and every contemporary tension turns on this truth. Wanton independence from God’s way does carry penalties – the severest penalties imaginable in this instance. On the other hand, the account demonstrates that keeping God’s way brings salvation, in the broadest sense. For Noah, it is simply about obedience to God. For us the relationship is more nuanced; it would be better expressed in our knowing God in such a way that, what we want to do most, is to please Him by walking closely with Him. There is also an early lesson here about waiting for God, and doing what He says, in His timing and not ours. Noah waited the best part of a year after the water started going down, before he knew – he heard from God – that it was time for him to lead the way out of the grounded ark, which had served its purpose. Think about an area of your life where you can see a way to move forward but you are still awaiting God’s release. p class=”p1″>When you see a rainbow, what do you sense God is saying to you or reminding you?